Three quarters of the original SABBATH line-up returned to their old stomping grounds of Orange County, California last night. I underestimated how many of the devoted would turn out for a show on a Wednesday night as it was nearly a sell out with people making the pilgrimage from near and far. As the house lights went down, the sound of the sirens signaled that “War Pigs” would be the night’s opening song. Even from right outside the amphitheater, the absolute heaviness could be felt. To nobody’s surprise, the band’s set focused on the first three records, Black Sabbath, Paranoid, and Master of Reality. While you can’t question the love the masses have for SABBATH, it is a safe assumption that the majority do not spend much time with Vol. 4, Sabbath Bloody Sabbath, or Sabotage, and would quickly complain if the band started playing “obscure” tracks such as “The Writ” or “Tomorrow’s Dreams.” One gem from Vol. 4 did make the set in the form of “Under the Sun.” They also performed three songs from the solid reunion album, 13. The reunited BLACK SABBATH have posted a video, which highlights a look into the recording sessions with producer Rick Rubin. As previously posted, RAGE AGAINST THE MACHINE/AUDIOSLAVE drummer Brad Wilk will play drums on the record in place of Bill Ward, who is no longer part of the reunion. Can’t wait for the new record, 13! BLACK SABBATH have announced the title of their new album, 13, which will be released this June (exact date TBA). The original BLACK SABBATH (sans Bill Ward) have recorded the album primarily in Los Angeles and were joined at the sessions by drummer Brad Wilk (RAGE AGAINST THE MACHINE). Produced by Rick Rubin (seven-time Grammy winner), the album will be released on Vertigo (worldwide) and Vertigo/Republic in the U.S. 13 marks the band’s first studio album together since 1978’s Never Say Die! The original line up have sold over 70 million albums. In advance of the album’s release, BLACK SABBATH will head to New Zealand, Australia and Japan for live performances (see below for tour dates). Additional tour plans will be revealed in the coming months. Let’s try to get through this work week with SABBATH‘s classic song, “Killing Yourself to Live” off of the band’s 1973 masterpiece, Sabbath Bloody Sabbath. This performance of the song comes from the band’s famous appearance at the legendary California Jam in 1974. It’s not often that we get to see a moustache-less Tony Iommi. Enjoy! “We have decided not to make any detailed comment on Bill‘s latest statement. There are two sides to every story. We have been working hard at rehearsals making excellent progress after Tony‘s treatments and we have engaged a substitute drummer for the forthcoming shows. See you at Download. On May 15th, 2012, Bill Ward posted the news on his website that he would not be apart of the upcoming SABBATH reunion shows scheduled in Birmingham on May 19th, 2012, Download Festival on June 10th, 2012, and Lollapalooza on August 3, 2012. “I sincerely regret to inform you that after a final effort to participate in the upcoming SABBATH shows a failure to agree has continued. At this time I have to inform you that I won’t be playing with BLACK SABBATH at the Birmingham gig dated May 19th, 2012, nor will I be playing at Download on June 10th, 2012. Further, I will not be playing at Lollapalooza on August 3, 2012. “It is with a very sad heart that I bring you this news. I am sincerely passionate in my desire to play with the band, and I’m very, very sorry that it’s fallen to this. This statement is even more painstaking to write, as I was particularly excited to play alongside Tony Iommi after the recent treatments he underwent. I wanted that to become a reality. Read the whole statement here. “Well, I’ve had the last dose of chemotherapy so hopefully my body will start to get back to normal soon, the steroids were the worse. I’ve now got three weeks of radiotherapy coming up which I’m told can be very tiring so we’ll see. “A big thanks to Ozzy and Geezer for coming over to England, it was a big incentive for me, we managed to work most days and have some great new tracks. “And, importantly thanks again for your kind messages, hope to be seeing you soon. The final great BLACK SABBATH record with the band’s original line-up rarely gets the love it deserves outside diehard SABBATH fans. Most every tribute album or SABBATH cover song skips over this massive album. 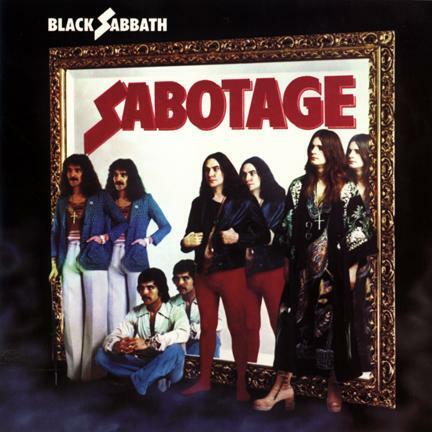 While I love the five albums that preceded 1975’s Sabotage, this is the SABBATH album that spoke to me most as a teenager who was totally immersed in discovering all the heavy music I could get my hands on. To this day, I only own this album in cassette format. It’s the most depressing and emotionally powerful album in that disillusioned and maddening sense. The band were undoubtedly living life to full excess but were very much in touch with their souls. After the first three songs, “Hole in the Sky,” “Symptom of the Universe” (the first thrash song ever written) and “Don’t Start (Too Late),” Sabotage really takes off on its epic journey through alienation, disillusionment, and liberation. The band wore their heart on their sleeves and that is something that really resonated in and connected with me as a disillusioned kid at the time. While it is a crime to be a casual SABBATH fan, it’s never too late to learn about and subsequently worship at the altar of the gods. Let us enjoy some selections from this great work of art. Together for a short but memorable timeâ€”a trio of studio albums, a classic live album, and a couple of toursâ€”the second coming of BLACK SABBATH began in 1979 when founding members Tony Iommi and Terry â€œGeezerâ€ Butler were joined by Ronnie James Dio. The former singer of ELF (and later RAINBOW and DIO) added his fiery, demonic howl to the Rock and Roll Hall of Fame groupâ€™s crushing mix of iconic riffs, gloomy grooves and doom-soaked imagery. In late 2006 Dio, Iommi and Butler, joined by drummer Vinny Appice, reunited to record three new songs for Rhino Recordsâ€™ era-spanning collection, BLACK SABBATH: The Dio Years. These recording sessions went so well that the quartetâ€”billed as HEAVEN AND HELLâ€”will launch a highly anticipated world tour this spring. The group will play a dozen dates in Canada in March before taking the stage of the famed Radio City Music Hall in New York City on March 30 to play their only U.S. date until the band launches a full tour of the States later this year. The first comprehensive introduction to the bandâ€™s legacy, BLACK SABBATH: The Dio Years features a dozen classic studio recordings, plus one live trackâ€”â€œChildren of the Seaâ€ from 1982â€™s Live Evil. The collection also contains the three brand-new tracksâ€”â€œThe Devil Cried,â€ â€œShadow of the Wind,â€ and â€œEar in the Wall.â€ The disc will be available April 3rd. Arranged chronologically, the compilation spotlights Dioâ€™s time with BLACK SABBATH and draws heavily from the lineupâ€™s 1980 debut and 1981 follow-up, Heaven and Hell< /strong> and Mob Rules respectively. The Dio Years also features â€œAfter All (The Dead),â€ â€œTV Crimesâ€ and â€œIâ€ from the singerâ€™s brief reunion with SABBATH for the Dehumanizer album and tour. On May 1, Rhino Handmade will release BLACK SABBATH: Live at Hammersmith Odeon, which features Dio, Iommi, Butler and Appice getting hot one December night in London during their 1981 tour for Mob Rules. Previously unreleased, the concert spotlights SABBATH as they storms through 14 of the Dio-eraâ€™s best. The band also performs several pre-Dio classics including â€œParanoid,â€ â€œChildren of the Graveâ€ and a white-hot version of â€œWar Pigs.â€ The album will be available from Rhino Handmade as an individually numbered limited edition of 5,000 copies.